Ideas for green living may begin with energy conservation and water conservation, but they must go beyond that. Thus the eco-friendly landscaping ideas that we will explore in this article extend to issues of environmental pollution and overuse of landfills, as well. At the conclusion of the article, furthermore, ten recycling ideas will be presented. "Eco-friendly" is shorthand for a modern approach to life in the West that exhibits a heightened sensitivity (relative to Industrial Age precedents) towards environmental concerns. As in other aspects of our lives, in our landscaping we can implement ideas for green living to save energy, make the earth a cleaner place in which to live -- and save money, to boot. Reel lawn mowers are an eco-friendly alternative to gas-powered rotary models and a true boon to energy conservation. These devices are muscle-powered, so there's no engine involved. Using them not only promotes energy conservation but also clean air. So far we have considered how we can promote energy conservation and water conservation in our landscaping efforts. Now it's time to tackle the equally challenging issues of environmental pollution and the overuse of our landfills. In the context of landscaping, three of the most significant ways to reduce environmental pollution are by cutting back on the use of chemical herbicides, pesticides and fertilizers. But the use of chemical herbicides is not the only culprit responsible for environmental pollution in landscaping. Our wars against garden pests (whether insects, rodents or others) have been fought just as fiercely as our weed wars, and we've pulled out all the stops. But to reduce environmental pollution, consider alternatives to chemical pesticides. Chemical fertilizers round out the "big three" of environmental pollutants in landscaping. Fortunately, it's very simple for homeowners to switch to a natural approach when it comes to providing the landscape with nutrients. For instance, did you know that you can be mowing your lawn and fertilizing your lawn simultaneously? Well, you can, at least if you use mulching mowers. With mulching mowers, you can let the grass clippings fall where they may, acting as an organic fertilizer. If you do not own a mulching mower, all is not lost. In your case, you can compost your grass clippings. But don't stop there. Get into the habit of composting as much as you possibly can. Composting is a terrific way to reduce environmental pollution. You'll also be reducing the amount of unneccessary material being transported into landfills. Note that compost holds many virtues beyond its ability to fertilize the plants in your yard. Compost also helps with aeration in soil, as well as helping soil retain water better -- so that you won't have to water as much. Got a soil that's too clayey? Add compost: it will help clayey soil drain faster. Got a soil that's too sandy? Add compost: it will help sandy soil retain water longer. Successful composting depends on the proper mix of "green" material and "brown" material. The former provides nitrogen, the latter carbon. With proper air circulation and moisture in your compost bin, a mix of two parts green to one part brown should decompose fairly quickly. Recycling is another great way to practice green living. The recycling information provided below represents but a small fraction of what homeowners can do to live earth-friendly lives. The focus is on recycling information that goes beyond just reducing the burden on our landfills. Follow these ideas for waste recycling and you'll not only be "saving the planet," but also saving money in some cases. We begin with five recycling ideas apropos to the holiday season, before moving on to more general recycling information. If you were lucky, you received gifts that were sufficiently "high-end" to be packed with packing peanuts. Before you take those packing peanuts out with the trash, consider how useful they may be as filler in your container gardens. Huh? you ask. That's right: packing peanuts are light and airy enough to offer great drainage at the bottom of a container garden, such as the raised beds I show you how to construct elsewhere. Why pay money for a product such as perlite to accomplish the same result, when the packing peanuts are free? You could also use crushed stone; however, not only will you have to pay for it, but its weight will make the container much heavier to move around. Thus this is one example of recycling information that will help you save money, as well as "saving the planet." Like using outdoor Christmas tree lights? 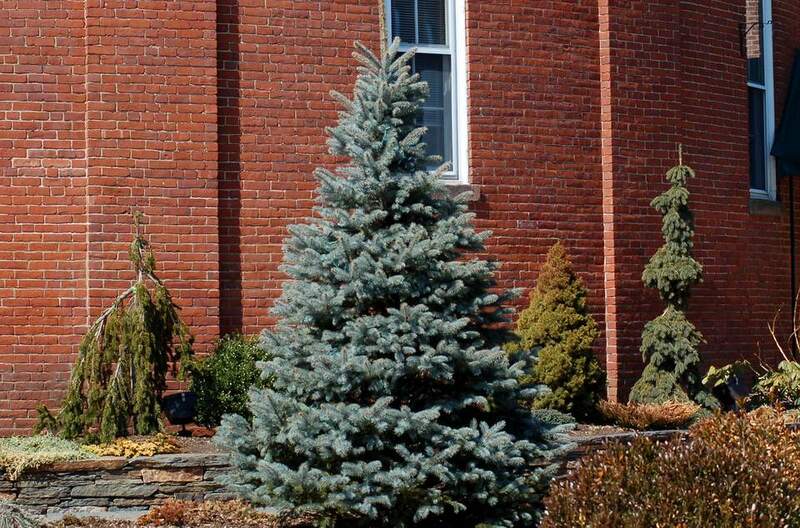 Why not buy a live Christmas tree and plant it outdoors later? That way, you'll be able to decorate it for many years to come with outdoor Christmas tree lights. If you follow this practice every year, you can eventually end up with a nice windbreak or privacy screen, without spending extra money at the nursery. Your Christmas trees can thus serve double-duty -- another piece of recycling information that will save you money. You can put your cut Christmas trees out in the backyard after the holidays are over, to provide shelter for wild birds. Recycling Christmas trees in this manner is just one of many ways that you can use plants to attract wild birds. Draw even more wild birds by hanging suet on the Christmas trees, or pine cones smeared with peanut butter and rolled in birdseed. For non-birdwatchers, another piece of recycling information pertaining to cut Christmas trees may be more useful. Saw off the branches, then saw the trunk up into smaller parts. Use this material as "flooring" with which to line the bottom of your compost bin. With the superior aeration such flooring will provide, your compost will break down faster. Give people plants for a holiday gift. A plant is a gift that will "keep on giving." Even if it does die, it can be recycled -- by composting it. Think of composting as "recycling plants." Furthermore, a plant doesn't come in a box, so there's no cardboard waste to dispose of. And if you wish to take "saving the planet" to another level with your gift, make sure the plant comes in a fancy container -- one too pretty to throw away! There will also be less temptation to cover up fancy containers with tin foil, which is not biodegradable. Alternatively, give people gift certificates provided by a local nursery. The recipients can then do their own shopping in spring. This alternative is not only enviro-friendly but will also reduce holiday shopping stress for you! If the recipients are not already committed to composting, this is a good opportunity for you to impart some recycling information, yourself: inform them of the benefits of compost. I provide more recycling information about compost on the next page. Now let's discuss the next six recycling projects -- ones you can undertake throughout the year. If you love plants, then making compost is among the smartest recycling projects for you. Making compost with grass clippings: Don't treat lawn grass clippings as waste. You can either bag them for making compost or, if you have a mulching mower, simply let them "fall where they may." Either way, they'll save you money on fertilizer. Making compost with weeds: Instead of poisoning annual weeds with chemical herbicides, pull them before they go to seed and put them in the compost bin. Without seed heads, they're harmless -- perfectly okay for making compost. Making compost with leaves: When you rake up leaves in fall, don't dispose of them as waste. Instead, turn them into leaf compost or mulch. Making compost with newspapers: You can recycle most newspapers for mulch or shred them up for making compost, instead of disposing of them. Using a combination of newspapers and bark mulch is an easy and natural way to kill grass, if, for example, you wish to convert a portion of your lawn to perennial beds, instead. Creating mulch from fallen branches: Rural homeowners committed to maintaining large tracts of land often must deal with vast quantities of fallen branches, especially after hurricanes. Using wood chippers, you can convert these branches into chips and have a ready supply of free mulch on your property. But note that wood chips deplete nitrogen in the soil as they decompose. To counteract this tendency, add a fertilizer to the soil prior to applying the wood chips. The fertilizer should contain at least a moderate amount of nitrogen, as indicated by the first number in the NPK string. For instance, a popular fertilizer such as 5-10-5 would be sufficient. If you can't afford a wood chipper, consider hauling such branches into out-of-the-way places on your property and building up brush piles with them. Brush piles provide housing for wildlife. But if you have a garden, locate your brush piles away from garden areas. No sense in providing gratuitous cover for garden pests.